CarPro EliXir Quick Detailer was created to combine the incredible hydrophobicity of a ceramic coating with the quick and easy application of a quick detailer. The results you get out of CarPro EliXir Quick Detailer are sure to completely change your perception of the capabilities of a quick detailer. CarPro EliXir Quick Detailer provides an infinitely deep gloss that will leave your car looking like you spent the whole day laboring over it carefully. Not to mention that CarPro EliXir Quick Detailer will make water bead and roll off your car at an alarming rate! There are many different types of contaminants to which your car is subjected. Each of them has varying level of severity and resolve. Of course, there are the incredibly tough contaminants that require nothing short of compounding remove effectively, but the clear majority of contamination is minor and light. Even this light contamination can still ruin a flawless shine. When you need to remove it effectively, there is no point in busting out your wash buckets and hose just to get rid of some light dusting 3 times a week. CarPro EliXir Quick Detailer gives you the perfect solution to this unavoidable issue that all car owners face. Instead of needing to wash your entire vehicle to get rid of this contamination, CarPro EliXir Quick Detailer can be used to quickly and safely remove the light soil from your paint. All you have to do is spray CarPro EliXir Quick Detailer on, buff it in, and buff it off! Simply spray CarPro EliXir directly onto the panel being treated and buff off! CarPro EliXir Quick Detailer will do more than just remove light contamination from your car. CarPro EliXir Quick Detailer is designed with incredible polymers that will work effortlessly to provide an intense level of shine to your paint. Probably the most important aspect of CarPro EliXir Quick Detailer is the hydrophobic qualities it instills in your paint. 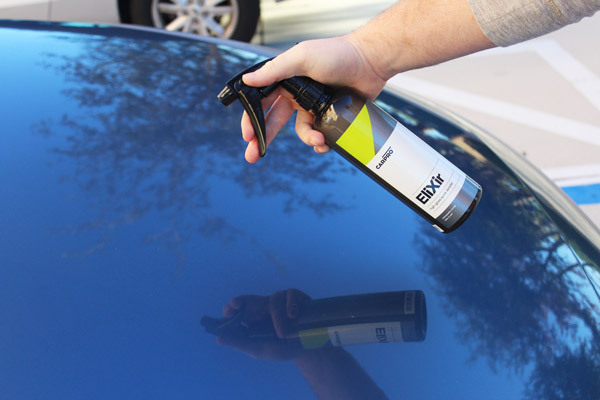 CarPro EliXir Quick Detailer greatly increases the tension on the surface of your car, preventing any water from being able to collect on the surface. Instead, the water will bead up on the paint without sticking. Now whenever you move your car or even if a light breeze goes by, the water will roll right off harmlessly! Directions: 1. Shake well 2. Spray half a panel sparingly 3. Immediately spread even, buff in, and buff off 4. Use a clean “final wipe” towel and check for perfection before moving to next section or panel.